Last summer's Esri International User Conference theme reflects the new and expanding role of GIS professionalscommunicating our world using GIS technology. This article explains this role and outlines some of the underlying technologies that will support this vision. Our world is changing rapidly, increasingly challenged and influenced by virtually everything we as humans doand also don't do. This change is being driven by a number of dynamics: increasing population, resource consumption, development and globalization, and political and social conflict. Finally, technological change, particularly in the information field, is growing and expanding our access to virtually every sort of knowledge. We are becoming an information-rich society. 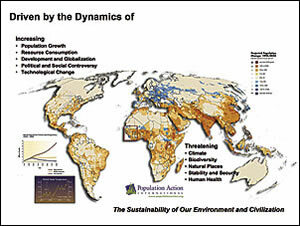 Perhaps more than any other factors, our population growth and related national resource consumption are two of our greatest concerns. These concerns are threatening our climate and biodiversity, our natural places, our stability and security, and human health. Some people suggest these ongoing changes will affect our ability to sustain our environment and, ultimately, civilization itself. Clearly we face a challenging future. To meet these challenges, we will all need to participate. As humans, we need to have greater understanding for each othermore empathy. We need to accept the shared sense of responsibility for what's going on throughout the planet and have the courage and will to act. On many fronts, we need more collaborative efforts and stronger leadership that consider all the factors related to policy and decision making. 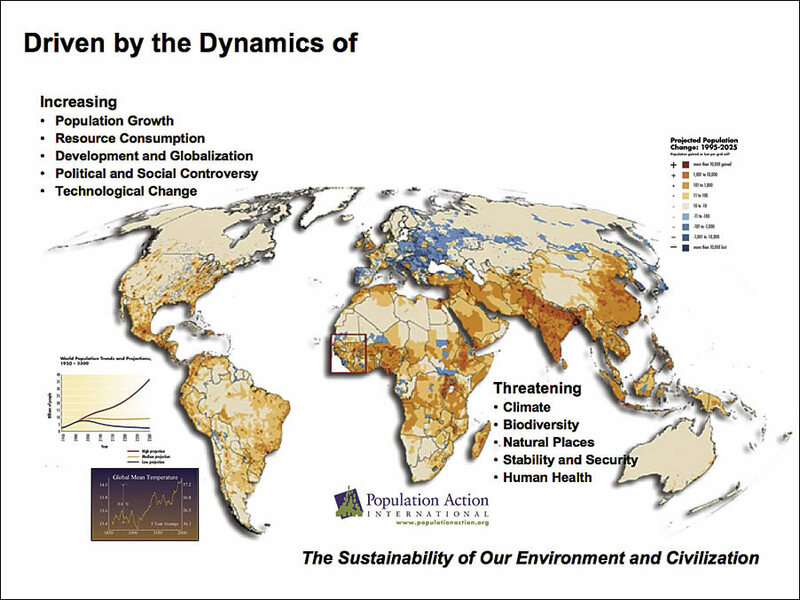 We also need geographic science as a framework for responding to these challenges. 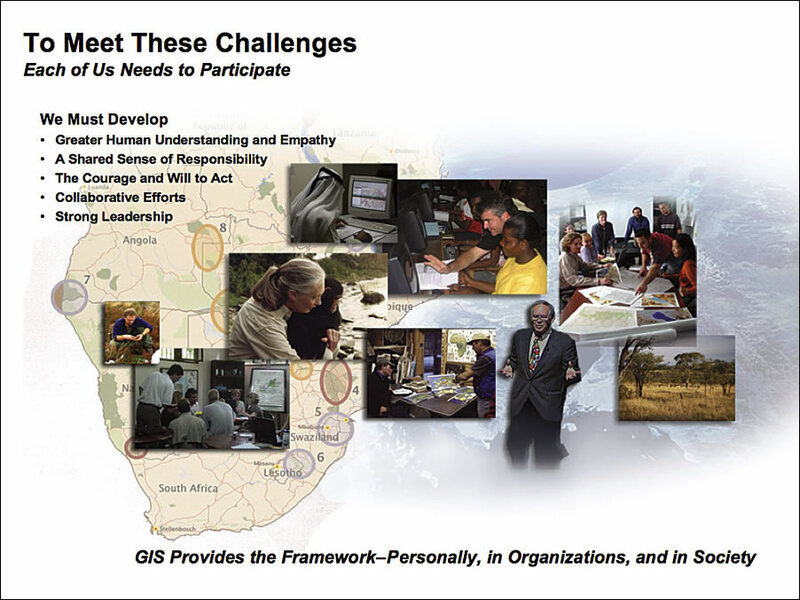 This is where GIS is beginning to fulfill a significant role, supporting our personal and collective efforts within organizations and society at large. GIS is becoming a new medium for humans to understand, communicate, and collaborate. 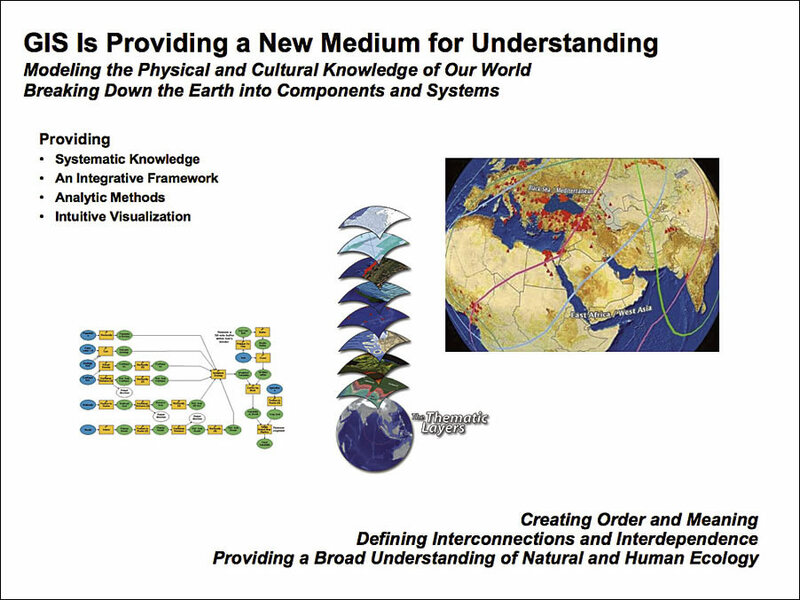 GIS is being used to model the physical and cultural knowledge of our world, breaking it down into components and subsystems, providing us with systematic knowledge, an integrative framework, analytic methods, and intuitive visualization. 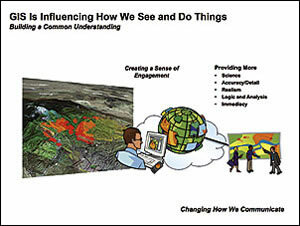 GIS is attractive to humans because it responds to both the cognitive as well as intuitive dimensions of understanding. 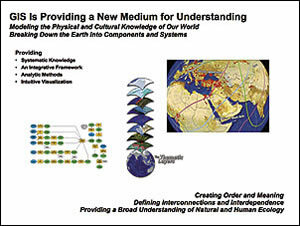 GIS creates order and meaning. It is helping us define interconnections and interdependencies, and it provides a broad understanding of nature and human ecology. GIS is influencing how we see things and how we respond. It is helping us build a common understanding, creating a sense of engagement, providing greater science and logic, and improving accuracy and realism. Finally, because GIS is integrating with real-time data or "sources," it is providing immediacy. GIS technology is evolving on the Web, making geographic knowledge easier to access and more available. As the natural and cultural processes of the planet become more wired or "connected," we will increasingly see new geographic information services and communities of users who incorporate these services into their daily decision making. 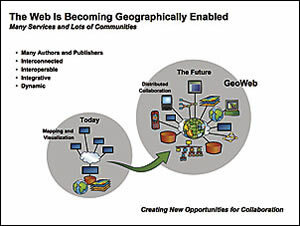 Some have called this new environment the GeoWeba geospatial dimension of the cyberinfrastructure. 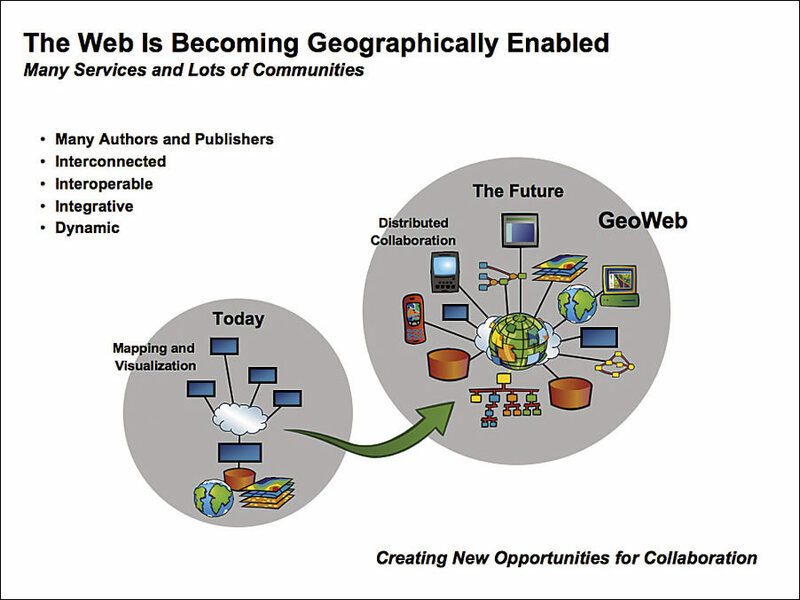 GIS on the Web will provide many new possibilities for sharing, integrating, and leveraging geographic knowledge. GIS professionals will increasingly make available (publish) their data, maps, spatial analysis models, and 3D visualizations as services for others to access and use. This will create a whole new way of thinking about GIS. 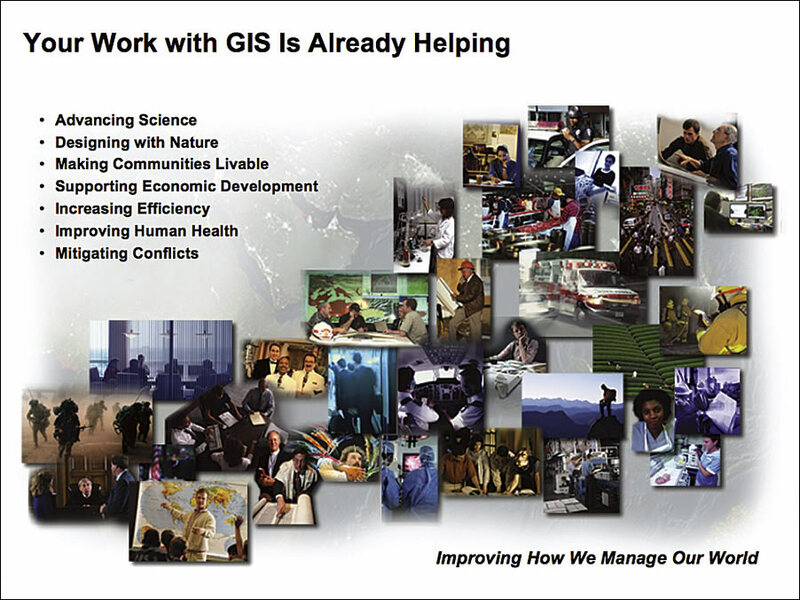 Our combined services will provide a new distributed GIS that is open, interoperable, and dynamic. Individual systems and communities will use each other's services, breaking down the earth into components and allowing the dynamic integration of knowledge. The management of this knowledge will be distributed. Services will be interconnected to create new services, and as a result, various parts of organizations will become increasingly collaborative and interdependent. Eventually, these services will provide a global network of geographic knowledge for the planet that is widely accessible and reflects the dynamic changes occurring. 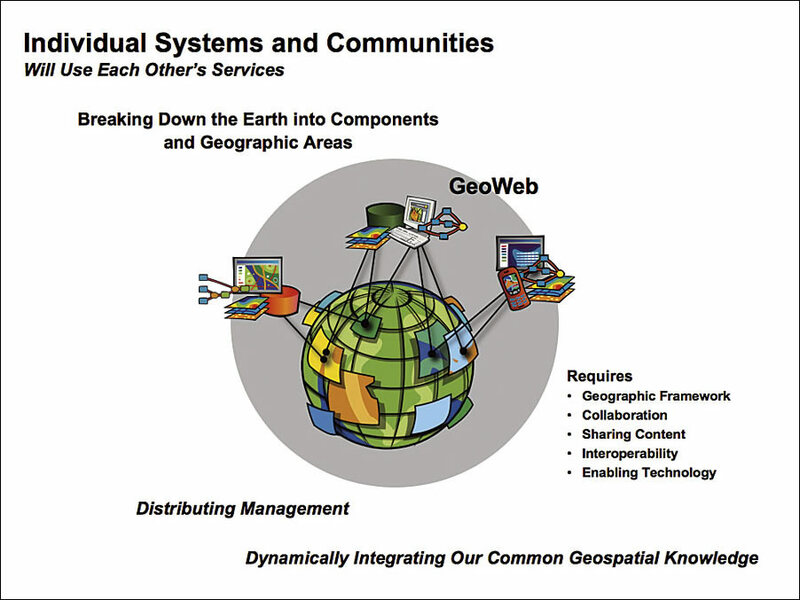 The GeoWeb requires the common georeferencing framework provided by geography. It also requires collaborative thinking and planning, as well as policies for openly and freely sharing content. It will require creative efforts by many to design and build a whole new class of Web-based applications. Finally, it requires enabling technology that is open and interoperable. 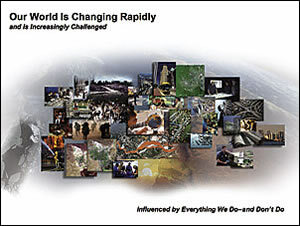 Enabling technology is evolving rapidly with faster computers, increased bandwidth, larger storage, Web services standards, mobile technologies, real-time server networks, and GIS software that is designed to work on the Web. Web-based GIS represents a whole new generation of technology that will dramatically change GIS professionals' ability to share and integrate their geoinformation. At 9.2, virtually all parts of ArcGIS (desktop, mobile, and server) have been engineered to operate effectively on the Web platform. 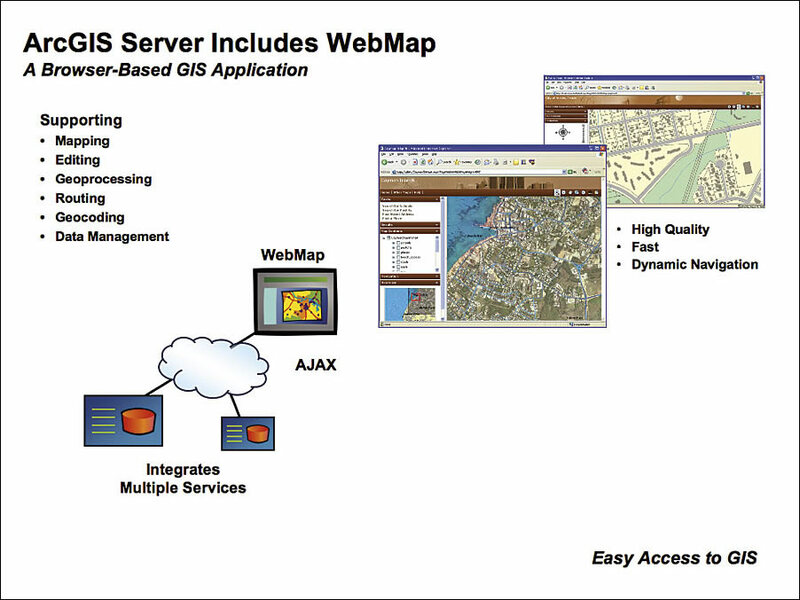 This means ArcGIS can easily serve and consume geoservices in a distributed Web services environment. 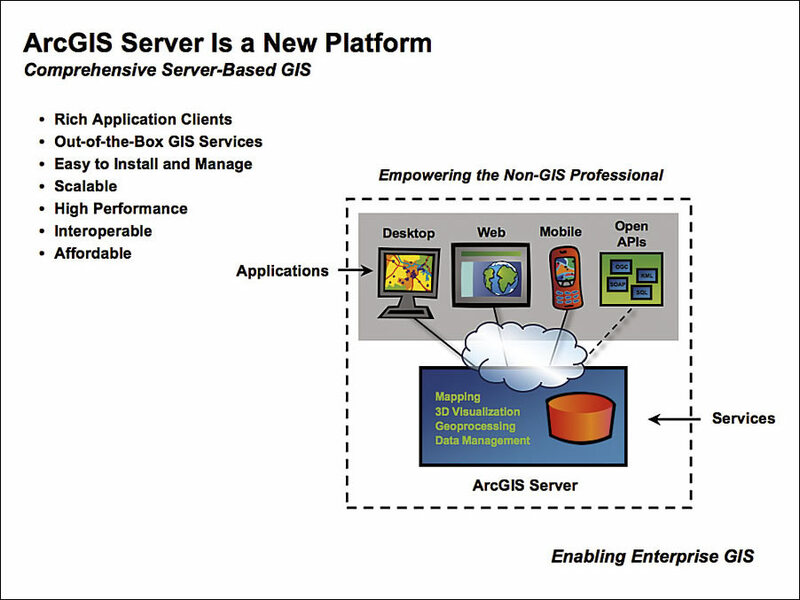 The most important building block of this capability is ArcGIS Server. 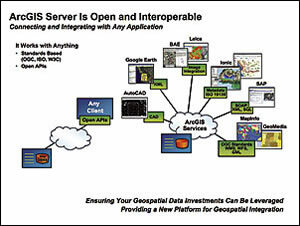 ArcGIS Server includes virtually all of Esri's GIS functionality expressed as geospatial services. Specifically, ArcGIS Server can manage all types of geospatial information and be used to publish GIS knowledge (maps, data, 3D visualization, and models) on the Web. At the same time, it can be used as a platform for building and integrating customer server-based applications. 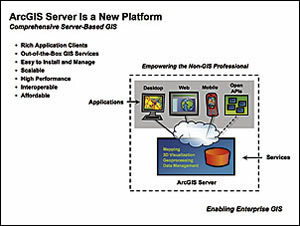 ArcGIS Desktop is used as a companion to the server in the sense that it can easily author and consume ArcGIS services. This browser-based application supports Web editing, server-based geoprocessing, geocoding, routing, and data management. It also uses the latest AJAX and raster caching technology for high performance and high-quality mapping on the server. ArcGIS Explorer is a free and easy-to-use Web application for visualizing and interacting with 2D and 3D information hosted on ArcGIS Server. 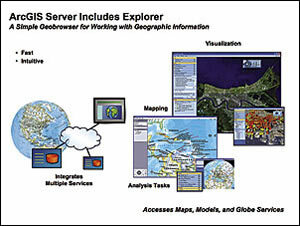 ArcGIS Explorer can be downloaded from the Esri ArcGIS Online Web site and used to access a free set of services hosted by Esri or other ArcGIS servers, such as ArcIMS or Web Map Server (WMS) mapping. 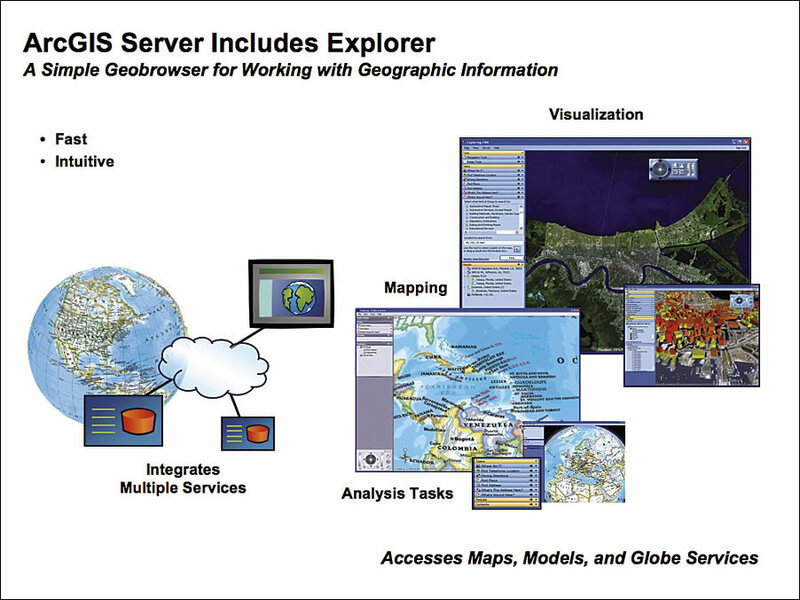 In addition to visualization, Explorer can task ArcGIS Server to perform spatial analysis and GIS applications. These can include complicated modeling, fusing of data from different servers, and running sophisticated applications on one or more distributed servers. 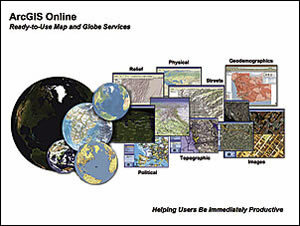 Starting in January 2007, Esri began hosting a set of globe and 2D image-based map services that can be used with ArcGIS Explorer and other Esri desktop products. 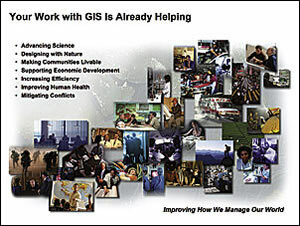 ArcGIS Online will also be the place where Esri will share other software services and updates. 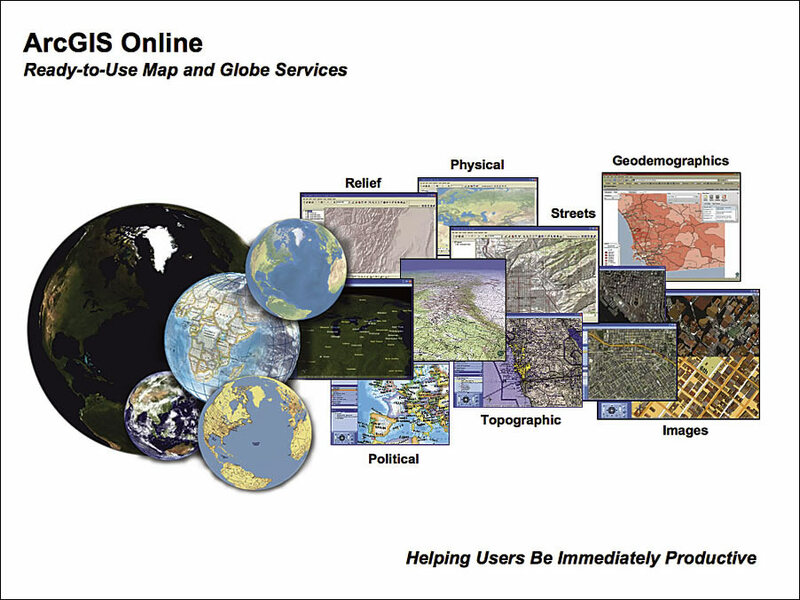 These free basemap/globe services will provide Esri users with a common basemap for sharing and integrating each other's services. 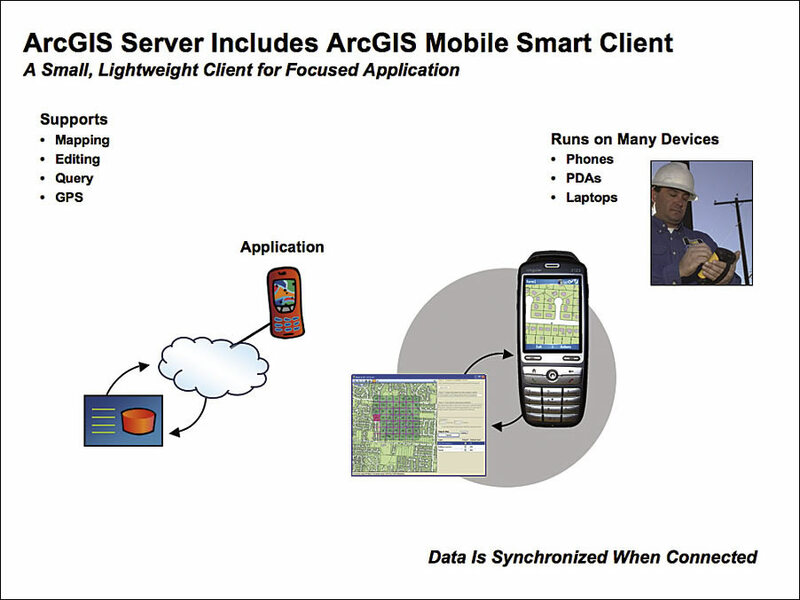 ArcGIS 9.2 also supports a new mobile smart client called ArcGIS Mobile. 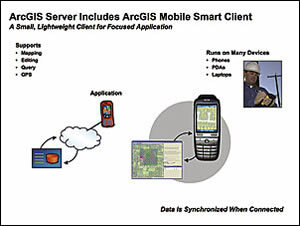 This client accesses and uses ArcGIS Server services from mobile devices. ArcGIS Mobile is designed to support location-focused applications that we often see in the field (mapping query, data capture, navigation, editing, etc.). The application is synchronized with the database on the server and provides real-time immediate access to data. This application can be operated in both a connected and disconnected mode. It involves a small, lightweight set of software tools that can be easily customized and downloaded to a cell phone, PDA, or laptop. 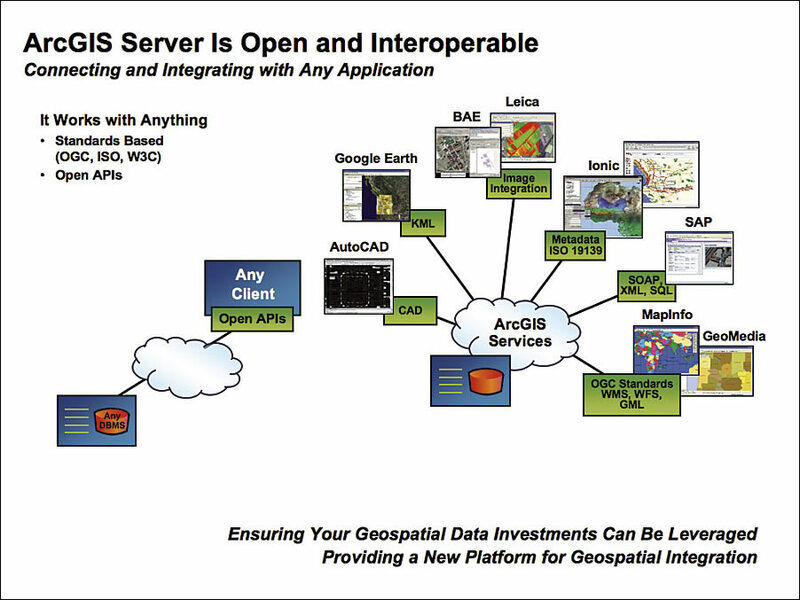 Finally, ArcGIS Server is open and interoperable with virtually any other geospatial client or Web service. It supports a series of direct interfaces and open standards-based APIs that allow it to be easily integrated with any other GIS or IT system. 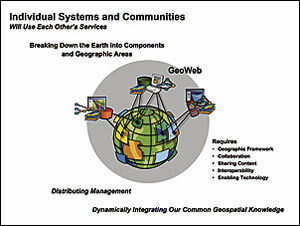 Implementing GIS in a distributed multiparticipant environment (e.g., the GeoWeb) requires attention to interoperability. 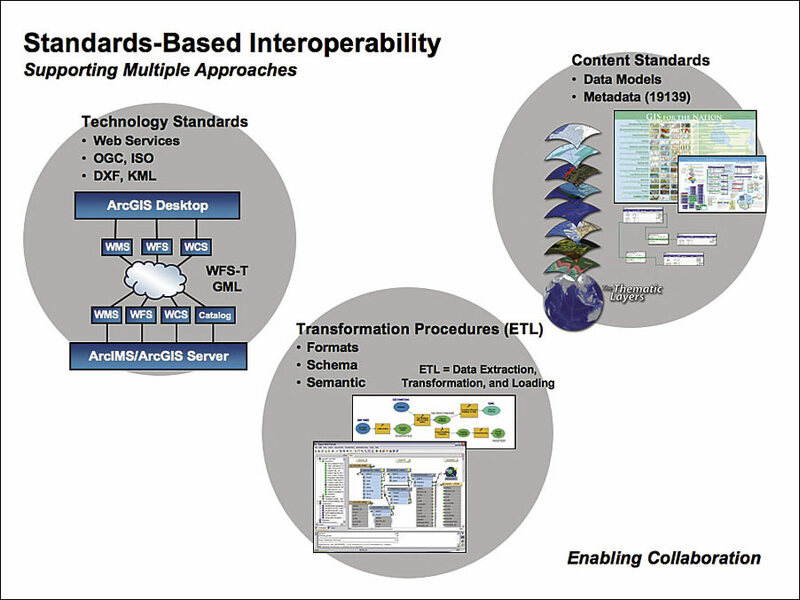 Esri is continuing to support three efforts to promote openess and interoperability with other geospatial, as well as IT, systems. 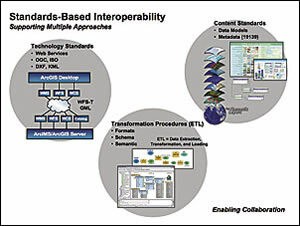 These are implementing technology standards; supporting extraction, transformation, and loading (ETL) procedures; and continuing to work on integrating standard data models. ArcGIS 9.2 offers full support for all the leading technology standards relevant to the geospatial field, including those pertaining to IT and the Web (i.e., ISO and W3C), geospatial technology (i.e., ISO and OGC), and support for the leading industry standards: DXF (CAD), KML (Google), VEML (Microsoft), PDF (Adobe), and many others. All of these standards are continuously evolving. Esri is actively involved in both the creation and evaluation of these standards and supports engineering them into our products. Transformation procedures involve the ability to extract (read) data, transform its format and schema, and load it into a different system. Esri has worked closely with our Business Partner Safe Software to develop an advanced technology extension that accomplishes these transformations with more than 150 formats and schemas supported. While transformation procedures have typically focused on batch processes, in the future, ETL will increasingly be used in a Web services environment. Esri has continued to work with various industry and scientific organizations to build data model templates that easily work with our software. This has both saved a great deal of time and effort by our users and also supported the widespread deployment of consistent, standards-based data models within the GIS community. Data models now exist for more than 30 areas, including transportation, geology, electricity, telecommunications, and land records. We have also worked with the Federal Geographic Data Committee (FGDC) and ISO standards organizations to improve our support for metadata, including support for the ISO 19139 standard that was recently released. While ArcGIS 9.2 provides many improvements for traditional GIS workflows, it will also open many new opportunities for widespread GIS access in the future. It represents for the first time a completely integrated system for authoring, serving, and using geographic knowledge on the Web. This will enable GIS professionals to do much more in a Web services and service-oriented architecture (SOA) environment. Many have characterized GIS as one of the most powerful of all information technologies because it focuses on integrating knowledge from multiple sources and creating a cross-cutting environment for collaboration. The work of GIS professionals around the world has clearly demonstrated the value of using geographic knowledge and GIS tools for applications in almost every discipline and field. Their efforts, together with the underlying technology, have stimulated a new geography-based approach to problem solving and thinking about our world. 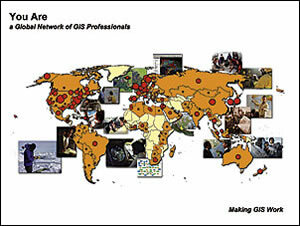 GIS is attractive to most people who encounter it because it is both intuitive and cognitive. It combines a powerful visualization environment with a strong analytic and modeling framework that is rooted in the science of geography. This combination has resulted in a technology that is science based; trusted; and easily communicated across cultures, disciplines, social classes, and languages. Until recently, comparatively few people have had direct access to the capabilities that GIS provides. This is changing as GIS technology fully emerges on the Web. The combination of the new ArcGIS Server technology and easy-to-use Web clients will open up the domain of GIS to many more participants. We believe that, over time, GIS will become more widely used to create a common understanding of what we as humans collectively know about our planet. This will provide many benefits to society and help us manage our future. 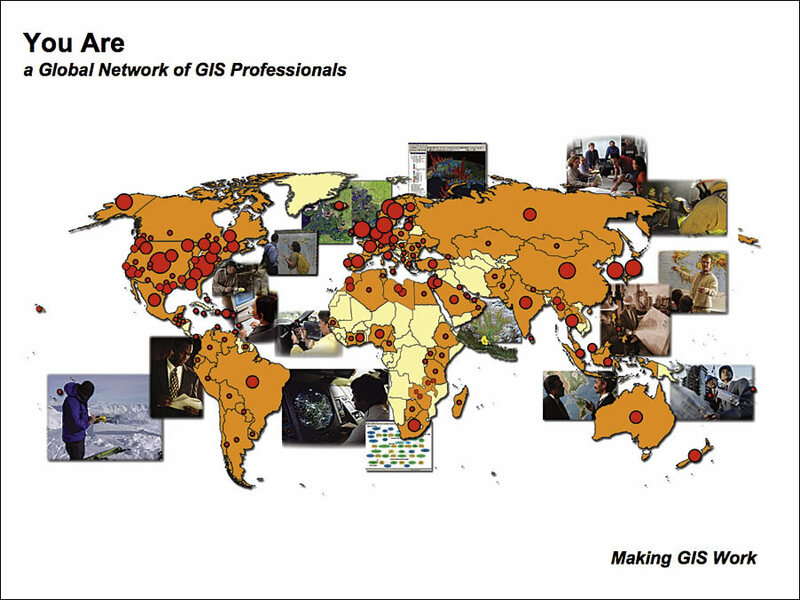 GIS professionals are central to this mission. Their work is helping advance many aspects of science. They are helping societies design a better future by considering all the factors of nature. They are helping improve human health, mitigate conflicts, and support business to become more productive and efficient. In almost every dimension, the work our users and partners are doing is improving the way that we communicate and manage our world. Our world is changing, presenting many challenges. GIS professionals, working together, will author and share the knowledge that will make a difference. It is my strong belief that this kind of collaboration will help us bring peace and prosperity and a more sustainable world. See also "GIS and Society."